One of my first memories of a helicopter was watching a Phoenix Police MD520 land in Roadrunner Park, a block away from my house. The high pitch whine of the main prop was incredible, but another sound was missing. I gathered all my seven year old courage, and asked the pilot, “where is the tail rotor.” I got a lesson in aerodynamics that day, and to this day I can still identify an MD520 by sound. 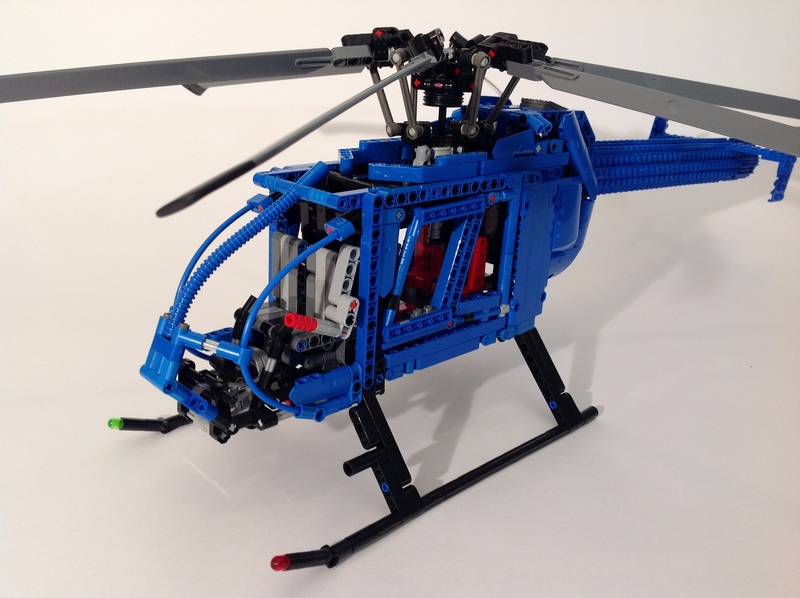 It still remains my favorite helicopter, so I figured it was high time for me to honor this aircraft in LEGO. Full gallery can be found here. Instructions may be found here. 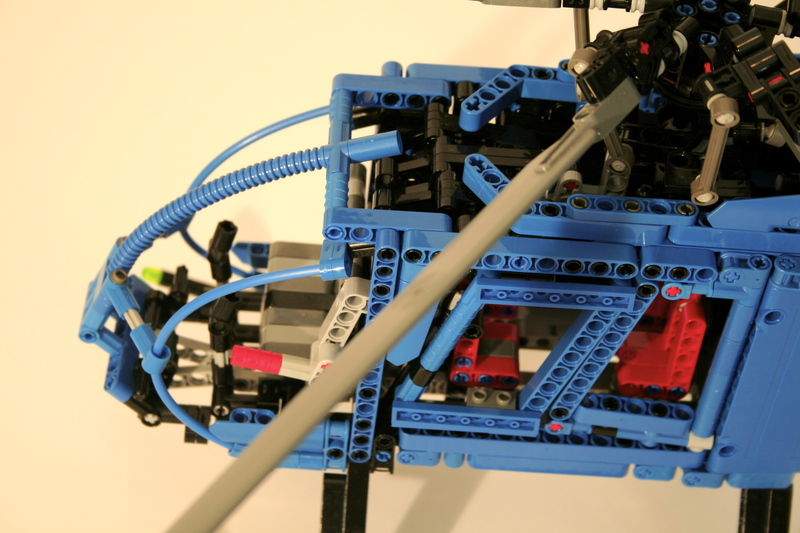 What excites me about building with LEGO Technic is creating functions that allow motor, movement, and control. Helicopters are mechanically complex, so I find myself drawn to recreating them. I learned about how they work when I built my first helicopter. 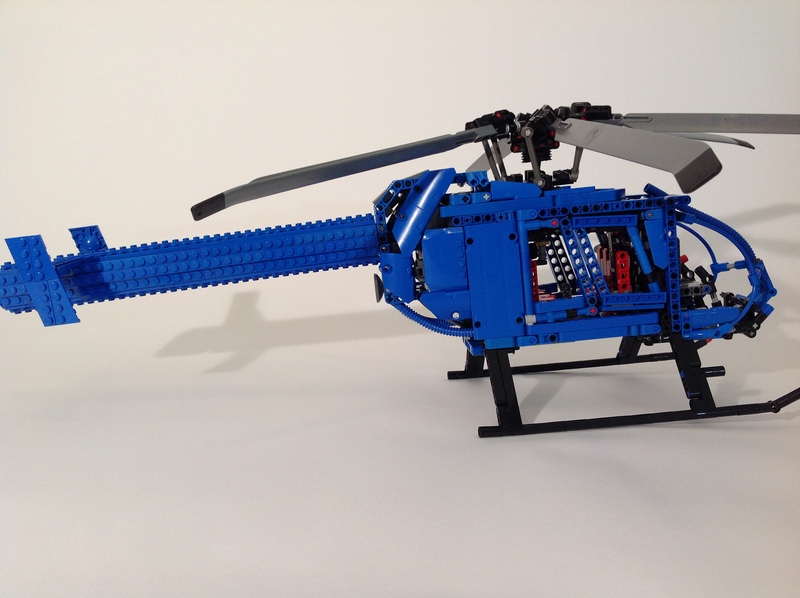 With this new helicopter I started with the rotor head. I first built Effermans great swashplate design, and figured out what should stay and go. A four blade rotor head seemed not quite right, so after a little work, I managed to get a six blade head. It was with this decision, and discovering in the chosen scale there would be very little internal room, that I decided to switch to making an MD 600N. I then got to work setting dimensions, and getting the scale of the airframe correct. 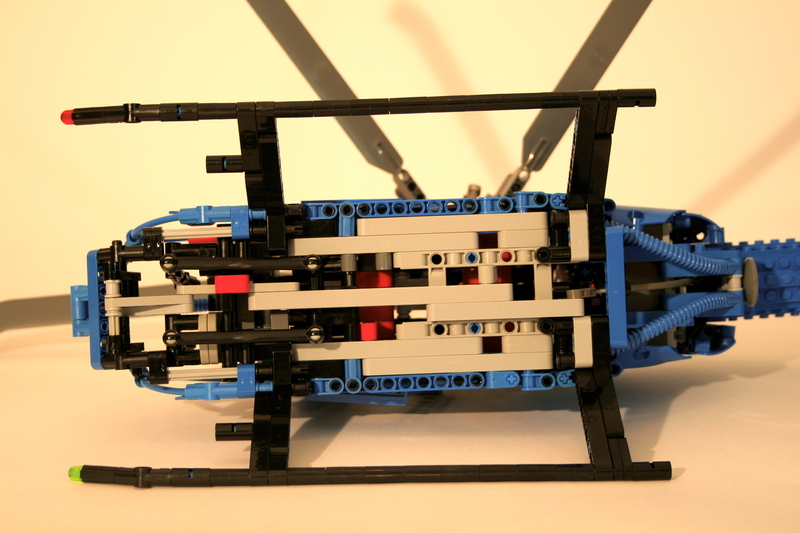 The length of the rotor blades dictated the scale, and the interior was going to be tight. The major challenge was getting the control functions connect to the cockpit. This is not a new challenge, as it seems to be the case with every large plane I do. I have a lot of experience with it, and so I came up with some solutions. The challenge with a helicopter is the collective. Every movement that is transmitted, must be able to retail its movement while also being effected by the collective. This works well with the swashplate, but at the controls is where this gets difficult. Using the basis of Effermans design allowed for a simple setup where the collective moves an axle on which the the left/right and fore/aft controls mount. Moving the collective moves the other two controls in a way that is independent from joystick inputs, and allows for complete swashplace articulation at any collective pitch. 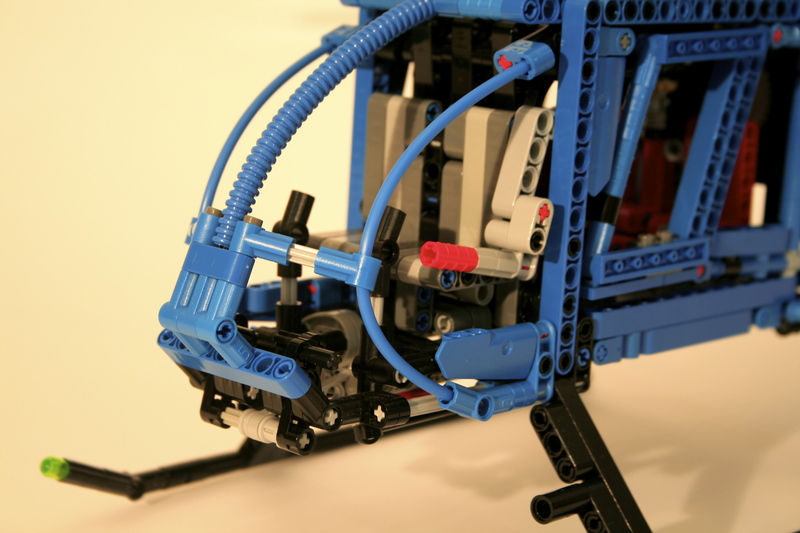 The controls connect to the swashplate above the main cabin and move forward. From there all three fuctions move down to the floor of the cockpit in between the pilot/copilot seats, and the second row seats. The collective is connected here to a lever on only the pilot’s side. The left/right controls connect via an axle to the joystick, and the fore/aft controls connect via a 9L link to the joystick. Both joysticks are linked together. The final control adjusts the yaw of the aircraft. The MD600N uses three methods to give anti-torque to the main rotor. In forward flight the 1) tail planes give directional stability. The tailboom also has 2) two slits that provide a “Coanda Effect” from the main rotor downwash. Finally, at the end of the boom is a 3) movable jet direct thruster (all are nicely discussed here). This thruster rotates to force more or less thrust against the torque of the main rotor, much like the more common tail rotor. In this MOC, the thurster rotates on a small turntable, and has an axle running through the boom the controls the rotation. The axle connects to the floor petals by way of a flex cable, and a liftarm running below the cockpit. Both pedals are linked together. Once all the controls were set, I could work on the body. I wanted the helicopter to be blue as I see it in my memory (almost). This presented some parts challenges, but not as many as I expected. The two suicide doors open to the main cabin, though I did not add any to the cockpit. Many liftarms and connectors were used for the rest of the cabin. I wish current Technic parts could facilitate the rather bubbly lines of the MD600N, but I was pleased with how it looked in the end. As with many of my large aircraft, this helicopter suffered from gummy controls. The range of motion of the controls reflect the scale for the model, but do not allow for great playability or demonstration of features. For something like a helicopter, I am interested in powering the controls surfaces and inputs controls via Power Functions much like this. Next time I guess. But the Helicopter looks great on my shelf, and it brings me back to a great time in my childhood. I hope you enjoy. wow! Awesome job as always! Looking forward to more builds!